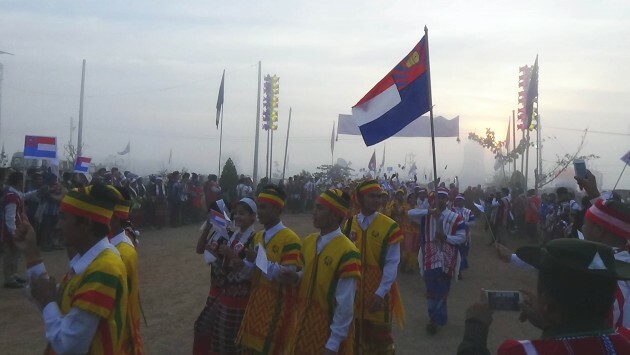 Karen people spread all over the world celebrated Karen New Year Day on January 10, 2016. Karen in Burma, on the border gathered at a wide variety of places to welcome the New Year. Celebration took place in Shwe Kokko, Rangoon and Hpa-an, where the former, President U Thein Sein attended. Aung San Suu Kyi, leader of the National League for Democracy, which won a landslide victory in the recent November 2015 election, including in Karen areas, sent a statement. In her statement, Suu Kyi called for unity among ethnic nationalities and urged them to seek a lasting peace for the country. Suu Kyi’s statement reassured that she will work towards building peace in Burma based on a political system that guaranteed the rights of Karen people and all other ethnic nationalities. Naw K’ynaw Paw, the secretary of the Karen Women Organization said Ms Suu Kyi’s reflected a desire to see power shared with ethnic people. General Mutu Say Poe called for Karen people to remain united in the current political situation. In his address, General Mutu Say Poe stressed that Karen Had to work together to achieve their rights. General Mutu pointed out that the heavily criticized Constitution had to fully guarantee Karen people their rights.